Joyce R. Becker Landscape Quilts – Dryer Lint, Etc. Have you ever wanted to create a unique quilt, just for the heck of it…..This is a “green” quilt, using an extensive collection of dryer lint collected by myself and many of my quilting friends. Most of the quilt, excluding the sky, is made up of dryer lint, overlays of Angelina, silk fibers, and in the foreground, my collection of the leftover threads I snip off when stitching (I store them in an empty Kleenex box…..) The rows of mountains that are furthest in the distance were created with gray dryer lint that I molded, and needle punched. The closer rows are dryer lint that were covered with tulle, and machine embroidered free-motion. The entire lake is dryer lint with overlays of different colors of Angelina fiber. I enjoyed quilting this piece with silk thread and love the little bubble or rock formations created on the border with the thread. 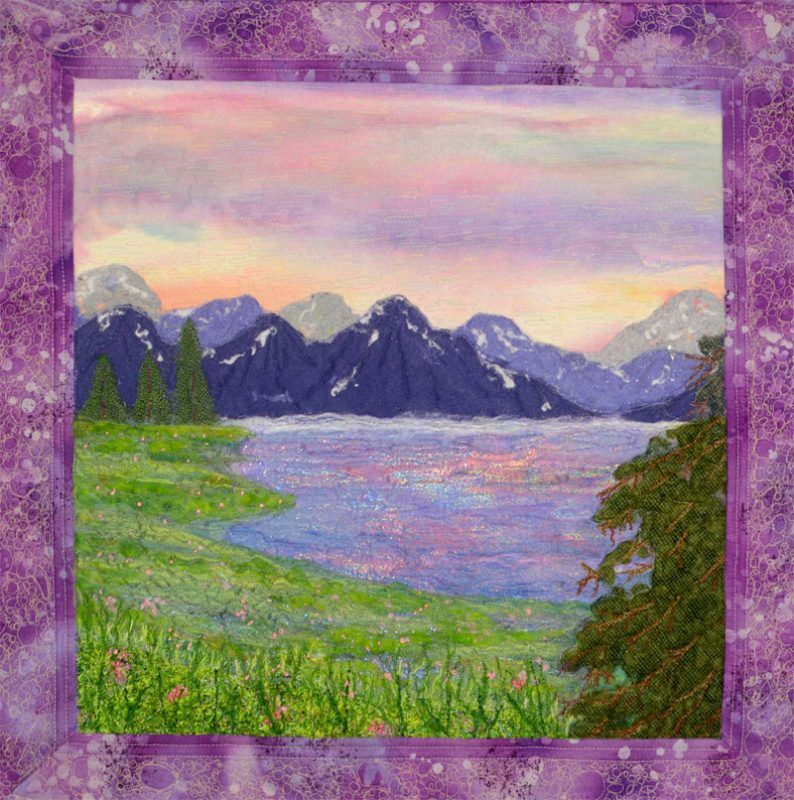 It is featured on the cover of my book, Quick Little Landscape Quilts.